petunia is there a plant with tiny blooms? There are hundreds of petunia varieties. The "SuperTunia" series have smaller blooms but the plant itself can grow large. However, you may be thinking of Calibrachoa, "Starshine Pink". 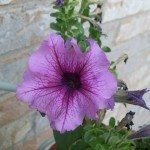 It is similar to petunia but smaller and better for hanging baskets.